As faithful readers of this blog know, I am a big fan of the Barack Obama’s foreign policy positions and decisions. Specifically, I like his deference to nuanced conditions and his emphasis on achieving the objective over claiming credit. In my neck of the woods – specifically, Libya, Somalia, and Uganda – he understands and appreciates the nuances that made previous incursions into the region unsuccessful. I think he understands that multilateralism and mutual respect can achieve more than the cavalier dependence on American exceptionalism. That is why when I read that he endorsed Jim Kim, co-founder of Partners in Health with Paul Farmer and a giant in the field of public health, for the World Bank presidency, I tipped my hat. Since its establishment, the executive positions of the World Bank and the International Monetary Fund (IMF) have been held by an American and a European, respectively. Former French finance minister Christine LaGarde recently replaced Frenchman Dominique Strauss-Kahn after – in one of the great ironies in the history of the institution – he was arrested for allegedly assaulting a Guinean woman. 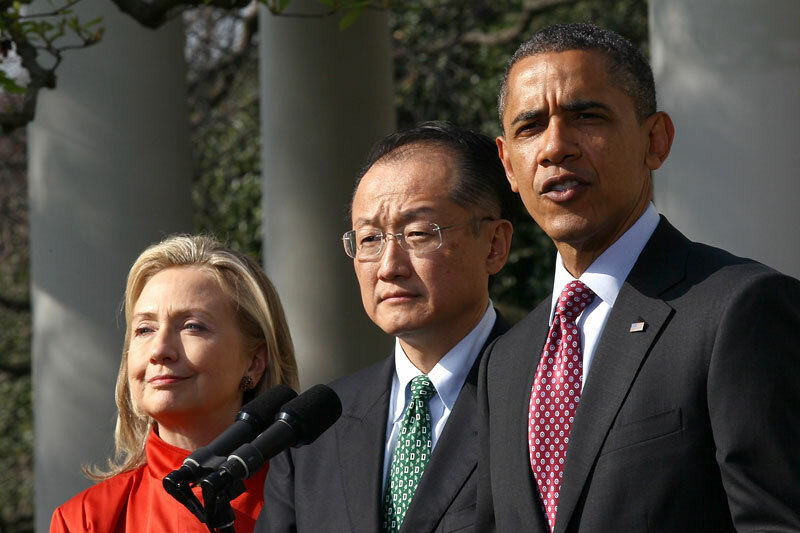 So when Robert Zoellick announced he would not re-run for the top spot at the World Bank, people debated whether Obama would be the first to break the streak and allow a non-American to run the Bank. There is good reason for the Americans to run the bank. For one thing, it was created by the U.S. and the Allies in 1944 at the tail end of World War II. Though it started as a lender to post-war European economies, by 1968, the World Bank had shifted its focus to developing countries, funding infrastructure projects and enacting various poverty alleviation strategies. With some policy shifts here and there – most notably during the Reagan years, where neoliberalism was the approach du jour and the Bank’s sister institution, the IMF, created controversial structural adjustment programs that saddled many developing countries with tremendous amounts of debt in exchange for opening their economies – the Bank has focus on eradicating poverty and improving the lot of the four billion people living below the poverty line. Some commentators will no doubt be offended by the idea that someone who is neither a banker nor an economist could occupy this post. Others may think that, in these difficult times, we need someone like Jim Kim, who combines academic rigour with practical first-hand experience of the reality facing the world’s poor. Kim’s appointment is a breakthrough for the World Bank, which I hope will extend to other global institutions as well. Until now, the United States had been given a kind of carte blanche to nominate anyone it wanted to the World Bank presidency. That is how the Bank ended up with several inappropriate leaders, including several bankers and political insiders who lacked the knowledge and interest to lead the fight against poverty. The Bank can be where the world convenes to address the dire, yet solvable, problems of sustainable development, bringing together governments, scientists, scholars, civil-society organizations, and the public to advance that great cause. This is a global imperative, and we can all contribute to fulfilling it by ensuring that the World Bank is an institution truly for the world, led with expertise and integrity. Kim’s nomination is a tremendous step toward that goal. Over the past few years, I have talked about Jim Kim a lot after my father – a physician and Dartmouth graduate – recommended the book Mountains Beyond Mountains about the work of Kim and Paul Farmer. My dad often compared people to either Farmer or Kim. The former loved working in the field directly with patients, while the latter preferred tackling the problem at a high level, prioritizing policy over practice as a way of maximizing his impact. Clearly, Barack Obama’s endorsement is both recognition of Kim’s record and another example of the strategic underpinning of Obama’s approach to foreign policy. After all, if Obama plans to pivot away from the Middle East toward Asia, endorsing Kim, an Asian-American born in Korea, sends the right signal. Plus, Kim’s impeccable record exists in spite of his American citizenship, yet the presidency of the World Bank would still remain in the hands of an American. As someone who works in the field and appreciates the nuances of foreign policy, I applaud the decision to elect Kim. I look forward to seeing what innovations he will bring to the institution.